Bottom Sealing Bag Making Machinery Taiwan Sing Siang Machinery Co., Ltd. Plastic Bag Sealing and Cutting Machinery. 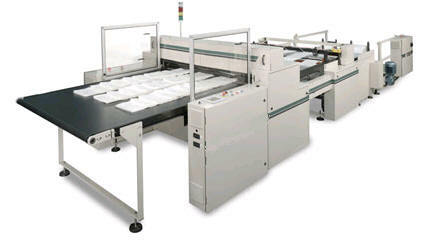 The POLYEAGLE is a dedicated Bottom Seal Bag machine that runs tube stock. The POLYEAGLE has a 5 h.p. A.C. Variable speed drive motor and A.C. variable speed capstan motor. The draw rollers are driven by a Servo. Draw length changes are made at the control console Key pad via the computer. The sealing is by a nichrome wire sealing system with standby heat feature. Choices of Double Seals or Single Seals are standard. Cut off is made by a Flying Knife System. Available in 41 " Solid and Split Configurations.